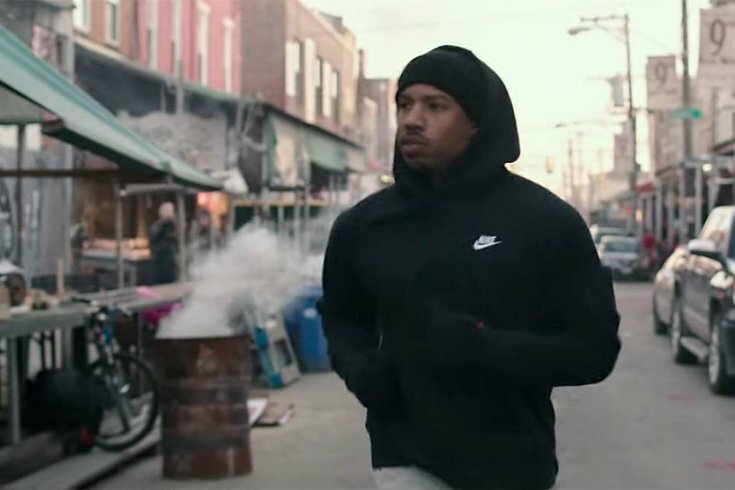 The character of Adonis Johnson, played by Michael B. Jordan, runs through South Philadelphia's Italian Market in "Creed." Friday afternoon University City got a visit from the film cast and crew behind “Creed II,” which has been filming in Philadelphia throughout the last month. Production trailers were spotted on the University of Pennsylvania campus at 37th and Sansom streets. Michael B. Jordan, who plays the film’s titular star, was spotted around 5:30 p.m. in a car on campus, waving to fans, around 37th and Walnut streets. The Daily Pennsylvanian shared a video on YouTube of Jordan passing through the campus. Friday’s is the latest sighting of the film cast in the city over the last few weeks. Jordan, in addition to being spotted working out at Sweat Fitness and (kind of) going to a Philly teen’s prom, was recently spotted dining at Zahav in late March with others from the "Creed II" cast. Sylvester Stallone has also been seen throughout Philly, doing an appearance at the Rocky Statue in front of the Philadelphia Museum of Art and, just last week, getting his hands on the Lombardi Trophy.